Learn how to interpret the different components of your consolidated statement. Click the “+” below to understand different parts of your consolidated statement. Except transactions performed by customer, other factors, such as change in foreign currency exchange rate, account interest rate and bank charges, will attribute to the difference between last month and this month statement balance (in HKD equivalent). HKD Deposits: the total of the positive account balances in all your HKD Savings, Current, Save & Cheque, New Generation Passbook Savings, New Generation Easy Saver Plan, Fixed/ Time Deposits, Equity-Linked Deposits “SID” Accounts. FCY Deposits: the total of the positive account balances (in HKD Equivalent) in all your FCY Saving, Current, Save & Cheque, Fixed/ Time Deposits, Premium Deposits and Structured Investment Deposits “SID” Accounts. Securities: the total market value of all Securities held in your Securities Accounts. The calculation of market value is based on the market closing price as of the statement date and the market value is for reference only. Fortune REITs are held by our bank on your behalf and safekept with our associated sub-custodian, “DBS Vickers (Hong Kong) Limited”. FX: includes FX related Structured Investment Product. Investment Funds: the total value of all investment funds held in your Investment Fund Account. The calculation of value is based on the unit price quoted by fund house close to the statement issue date for indicative reference only. It does not represent the current market price. 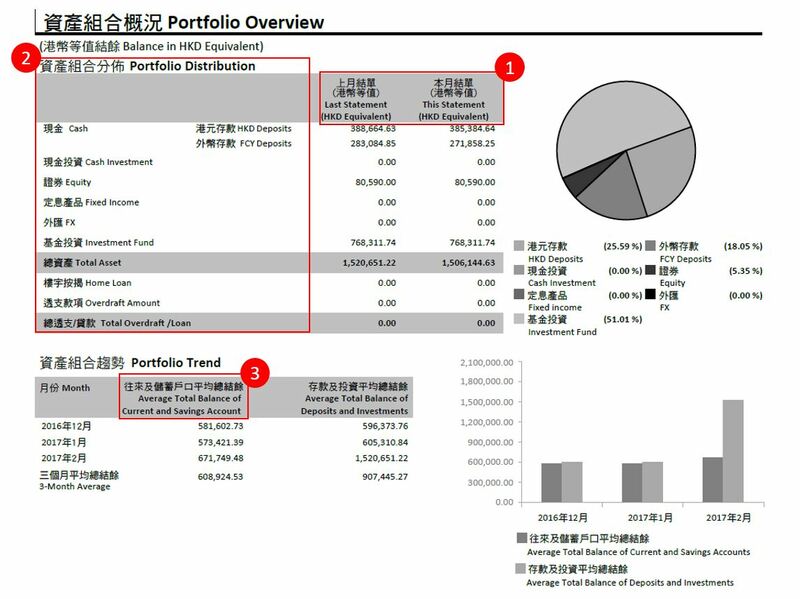 Total Assets: the total of the positive balance of your HKD Deposits and FCY Deposits and the total market value of your Securities and Investment Fund Accounts as of the statement date. Overdraft Limit: the total of overdrawn amounts of all current accounts (includes overdraft limit supported by secured facilities, unsecured facilities and/ or overdraft protection). Overdraft Amount: the total of overdrawn amount of all current accounts (includes utilized overdraft limit supported by secured facilities, unsecured facilities and/ or overdraft protection). 1. Summary & Transaction History: If the Statement Date falls on a Sunday or a public holiday, the Closing Balances of all your Cash accounts including Current Account(s), Savings Account(s) and Time Deposit(s) would be the positions as of the nearest Saturday or Bank Business Day prior to the Statement Date (“Closing Balance Date”). In such scenario, transaction(s) conducted after the Closing Balance Date up till the Statement Date would be shown in the subsequent month’s statement. The Account Summary of Cash Investment, Equity, Fixed Income, FX and Investment Fund captures the corresponding account position as of the Statement Date, while the Transaction History covers transaction(s) from the day following the previous month’s Statement Date up till the current month’s Statement Date. 2. Transaction History: includes all the transactions in the Savings, Current, Save & Cheque, New Generation Savings, Fixed/ Time Deposits (including Structured Investment Deposit “SID”), Equity-Linked Deposits and Securities Accounts. * Important Note: Information included is for reference only. In particular, transactions performed or instructions received on or about the statement date may not have been taken into account. Product Risk Rating (“PRR”) is classified into P1/P2/P3/P4/P5 with P5 being the highest risk rating. It is based on the latest information close to the statement date and is subject to change from time to time. Please note that the PRR is for your referenve only. For enquiries, please contact our branch staff. 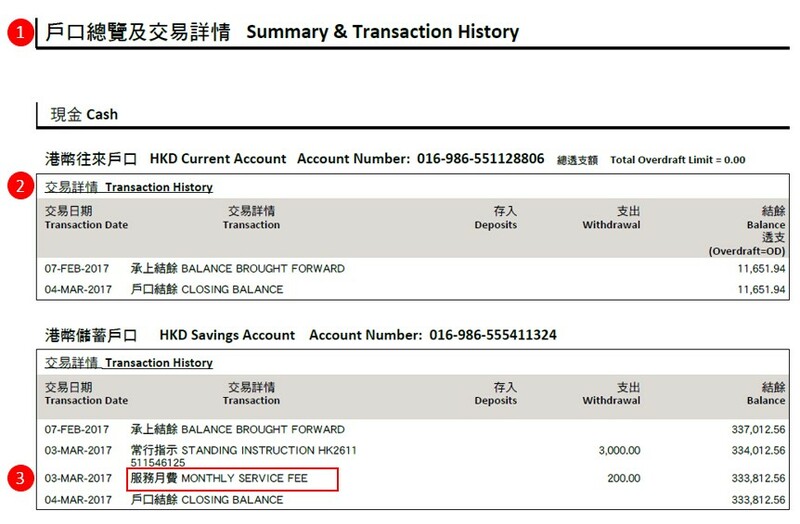 * Please refer to our bank’s website (www.dbs.com/hk) for individual product risk rating.